Nuclear and fossil fuel-burning power plants differ mainly in where their energy comes from; a nuclear reactor produces heat from radioactive metals, and a fossil-fuel plant burns coal, oil or natural gas. In addition to the technical differences between the two approaches, they affect the environment differently: Fossil-fuel plants are notorious for greenhouse gas emissions, whereas nuclear reactors are known for radioactive waste, which can remain hazardous for thousands of years. A fossil-fueled power plant relies on the ancient technology of fire to produce heat; such plants burn hydrocarbon fuels such as methane or pulverized coal. The process of combustion releases energy from the chemical bonds in the fuel. By contrast, nuclear reactors exploit the heat of radioactivity. The heavy, unstable atoms of uranium-235 and plutonium-239, both common nuclear fuels, decay into lighter elements while generating abundant heat. 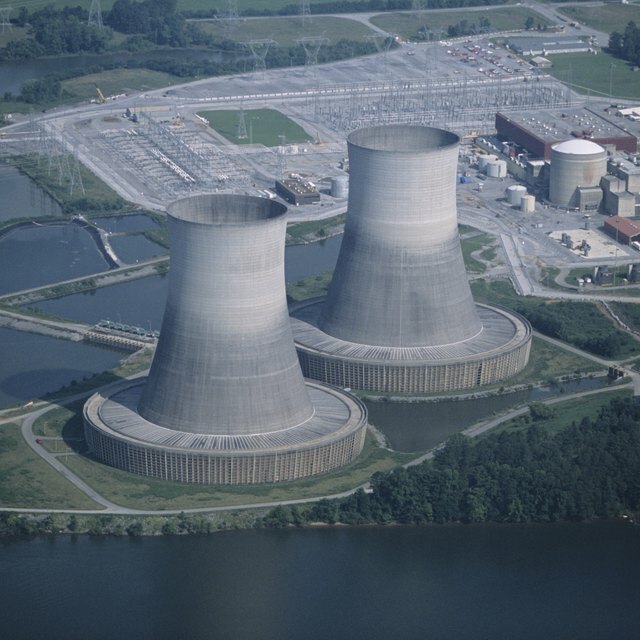 Because nuclear reactions are much more energetic than chemical ones, a pound of nuclear fuel carries about 1 million times the energy as a pound of fossil fuel. According to the University of Florida, a 1 gigawatt coal-fired power plant requires 9,000 tons of fuel per day; an equivalent nuclear plant consumes about 3 kilograms (6.6 pounds) of uranium in the same amount of time. The combustion reactions that power a fossil fuel plant consume fuel and oxygen and produce water vapor, carbon dioxide and energy. The combustion of coal, natural gas and oil always yields CO2, a gas believed to be strongly connected to global warming. Because coal and oil have noncombustible impurities, these sources also produce nitrous oxides, sulfur dioxide and other pollutants. A nuclear power plant does not use chemical reactions to produce energy; during normal operations, it has no gaseous emissions. Hazards exist with both fossil fuel and nuclear power plants, although many of the dangers are different. The reactor design of most operating nuclear plants requires the constant flow of water to keep the reactor from overheating and possibly releasing radioactivity into the environment; the Fukushima disaster in 2011 happened when water pumps failed. Coal-fired power plants generate large amounts of ash, solid waste that contains mercury, arsenic and other hazardous materials. Some plant operators contain the ash in gigantic ponds, which may rupture, contaminating the surrounding area. Such an accident happened in Tennessee in 2008, releasing 1.3 million cubic meters – 1.7 million cubic yards – of ash slurry. Papiewski, John. "The Differences Between Nuclear Power & Fossil Fuel-Burning Power Plants." Sciencing, https://sciencing.com/differences-between-nuclear-power-fossil-fuelburning-power-plants-21387.html. 10 March 2018. How Does an Oil Power Plant Work?